Install the clutch alignment shaft and the remover handle. To prevent warping, loosen the pressure plate mounting bolts (A) in a crisscross pattern in several steps. Remove the pressure plate (B). 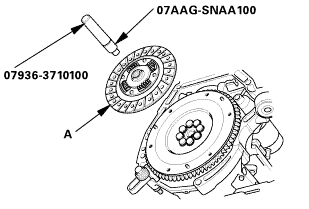 Remove the clutch disc (A), the clutch alignment shaft, and the remover handle. 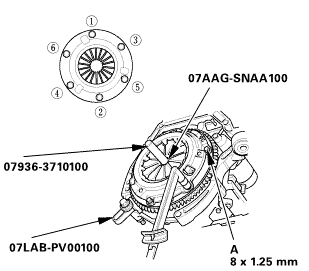 NOTE: Loosen the flywheel mounting bolts (B) in a crisscross pattern in several steps. 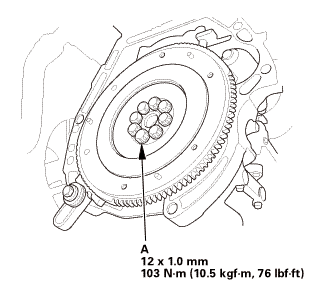 Install the flywheel (A) on the crankshaft, and install the mounting bolts (B) finger-tight. Tighten the flywheel mounting bolts (A) in a crisscross pattern in several steps. 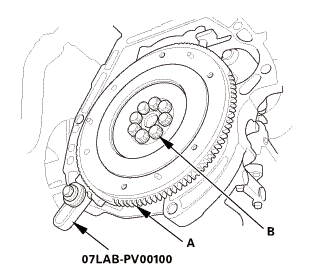 Temporarily install the clutch disc onto the splines of the transmission mainshaft. Make sure the clutch disc slides freely on the mainshaft. 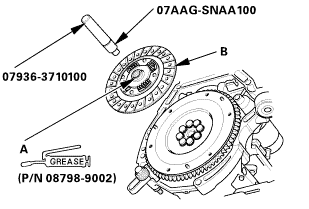 Apply super high temp urea grease (P/N 08798-9002) to the splines (A) of the clutch disc (B). NOTE: Wipe off any excess grease. 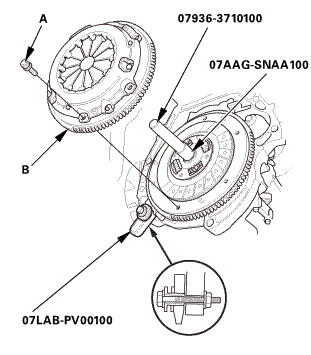 Install the clutch disc using the clutch alignment shaft and the remover handle. Install the pressure plate (A) and the mounting bolts (B) finger-tight. Torque the pressure plate mounting bolts (A) in a crisscross pattern. Make sure that there is no clearance between the pressure plate and the flywheel. 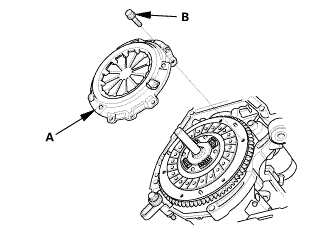 Remove the clutch alignment shaft and the remover handle. Make sure the diaphragm spring fingers are all the same height.